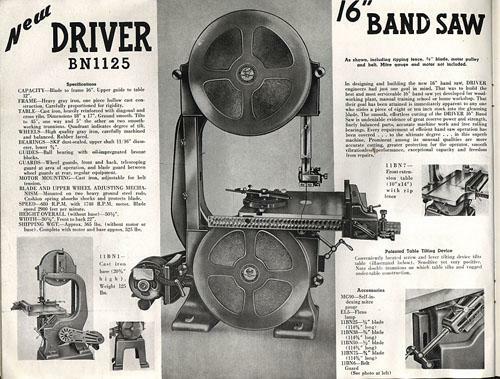 All Replies on Info on Old Band Saw? Info on Old Band Saw? Would you recommend this band saw? I am putting together my shop. Might use it for some resawing and general cut outs for carving. I wouldn’t rely on reviews for something that old. You’re best best is to carefully look over the machine for deal breakers like broken castings, non-standard blade size, missing parts (that you wont be able to get replacements for). Also check that a blade will track well and for excess vibration. Most issues like that can be fixed if you know how. If its tires and belts that need replacing, then its good. If the wheels are out of round or the axle is bent then that would be a deal breaker for me. Thanks! i don’t have much experience with Band saws but I am fairly handy so I will go check it out. WT made some really nice machines, it that is what it is. Looks to be missing the motor though. Seems like a great candidate for a restoration as long as the price is right. Has 12” of re-saw capability, appears to be on an original base and otherwise looks pretty complete. If needed, parts can still be found at places like OWWM and on the bay. Figure new bearings, tires, belt and blade at the very least.